If you have Google Analytics installed on your blog and you are keeping track of your traffic statistics, you are probably noticing that the amount of visitors you are getting from mobile devices is on the rise. As data plans get cheaper, people get busier and the iPhone continues to conquer the world, this traffic stat is going to continue to rise as time goes forward. The browsers on many of today’s mobile phones are pretty advanced and they have come a long way over the past couple of years. Cell phone web viewers can now see most of the functions on your blog just as they would on a regular computer, but on a little screen that is going to require more zooming and scrolling. Our job – as the blogger – is to make our content as easily accessible as we can for all readers, so what can we do to make this process easier on mobile phones? And more specifically – iPhones and Blackberry devices as those are the two most popular smart phones on the market. Luckily, there is an easy plugin for WordPress that handles all of your mobile browsing for you. While you could have a developer code up a theme that would show to your mobile visitors, WPtouch iPhone Theme takes all of that work and does it for you via a free plugin for WordPress. 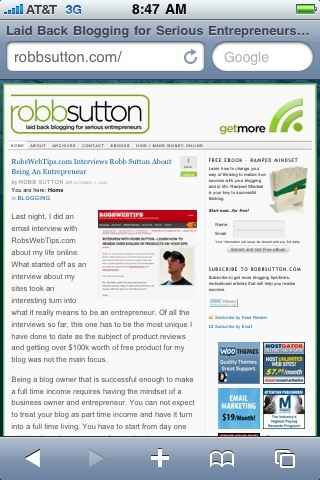 Better yet – it has customizable options where you can insert your own logo, change the background and change the settings to customize your blog theme on mobile devices. 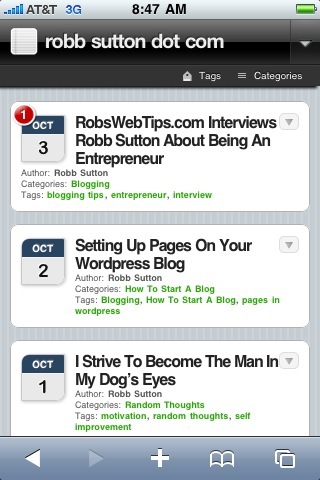 The picture below shows how robbsutton.com looks on an iPhone before the plugin and after. As you can see by the pictures, your content is much more accessible through mobile devices just by installing and activating this simple plugin. Note: I did not change a single setting as of that mobile theme picture. That is how your website will show on mobile browsers with all of the default settings in tact. What some more good news? All of you commenting, Google Analytics code (has to be inserted into the settings panel of the WPtouch iPhone Theme plugin), Google Adsense (again – has to be inserted via the plugins options panel) and most of the popular plugins you are already using are functional with this plugin. Even the Disqus commenting system I use on Mountain Biking by 198 is supported! The WPtouch iPhone Theme plugin for WordPress is one of those must install plugins if you want your readers to be able to consume your content efficiently on their mobile devices. Wow! Interesting post + plugin. I’m going to look into this for my blog seems really helpful. How do you like the plug-in so far? Seems good for Iphone users. It is working incredibly well so far. I have gotten comments from many happy cell phone readers. It is an excellent plugin, but for some reason, when I changed to a new main theme, my WP Touch doesn’t kick in on the mobile browser any more. I probably just need to do some more reading (when I have time), but it is such an easy and nice implementation, almost any WP site should check it out. Wow, very interesting and great tips, thanks! Now only i have heard like this ..Google analytics installed on our blogs.. I will try this surely.. Its really wonderful tips.. Thanks for sharing this information.. In everything you buy, whether that is a watch, shoes, clothes and even accessories you already have a style that you know is just you. Actually, there are even people that ensure that what they buy is similar to what they already own, so people could identify them according to their sense of style. Iphone are very useful and I am looking forward to have it this time.. I was wondering to know what is the starting price of apple iphone and according to you which will be best for me? I probably just need to do some more reading ,but it is such an easy and nice implementation, almost any WP site should check it out. It is an excellent plugin, but for some reason, when I changed to a new main theme, my WP Touch doesn’t kick in on the mobile browser any more.